When we began our homeschooling journey nearly thirty years ago, there was not the plethora of curriculum suppliers that we see today. 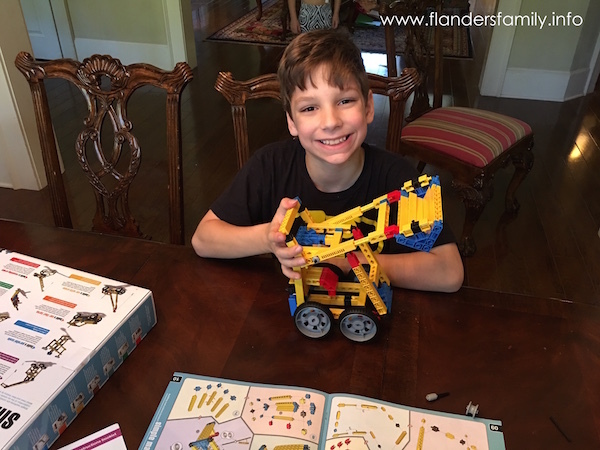 So I was very grateful when, as a young mom, I stumbled upon a family-owned company by the name of Timberdoodle that sold slightly quirky but wonderfully fun educational products and thinking games for children. We used these products in our schooling, we gave them as birthday gifts, we tucked them into Christmas stockings. You might say my kids grew up with Timberdoodle. Come May, six of our twelve children will have graduated from our homeschool. That puts us at the half-way mark! Of those top six, we have one ICU nurse, two dentists, one in his third year of medical school, one pre-med student, and an aspiring engineer. We credit the unsurpassed grace of God for their success — but the emphasis on critical thinking via Timberdoodle’s products didn’t hurt! The main difference is that our first set included a motor. It wasn’t extremely powerful — no zipping around like remote control cars — but it did make it possible to bring creations “to life.” That was really cool. 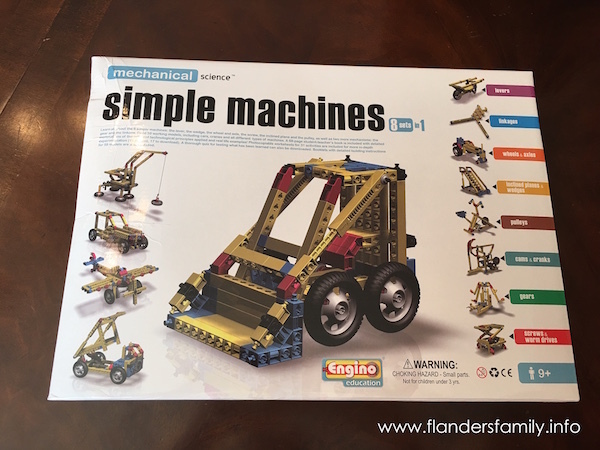 The Simple Machines set has no motor, but is extremely versatile, containing plans for dozens of building projects and activities — enough to keep a child busy for weeks as he (or she!) discovers first-hand how the forces of physics work. Guidelines on the box specify this set is designed for ages 9 and up. My 8-year-old and 13-year-old enjoyed building with it, too, and my 5-year-old had fun trying out the completed models, but none of them have stuck with it as long and with as much enthusiasm as our 10-year-old. All of them tell me they like the set. The pieces fit together easily and stay together about as well as Legos — which is to say, large sections may separate if you put too much pressure on them, but individual pieces will have to be painstakingly broken apart before you can build something else. Some parts of the Engino set require a tool (included) to attach and unattach them, which adds to the stability of the models. 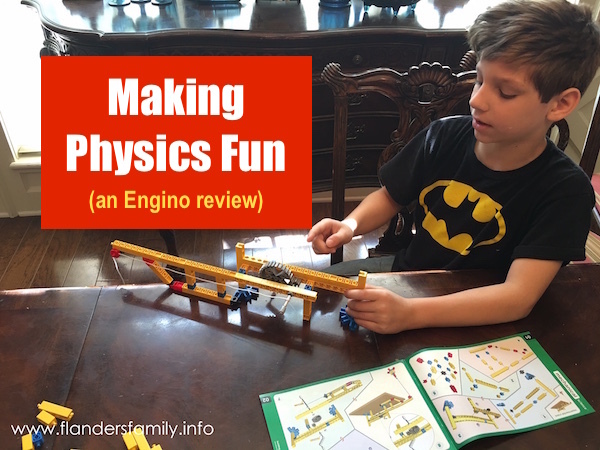 If your kids are big Lego fans, as mine are, they’ll likely enjoy Engino, as well. Just make sure you keep the Engino pieces separate from your Lego collection, as they are not interchangeable, but look enough alike as to make sorting them tedious. 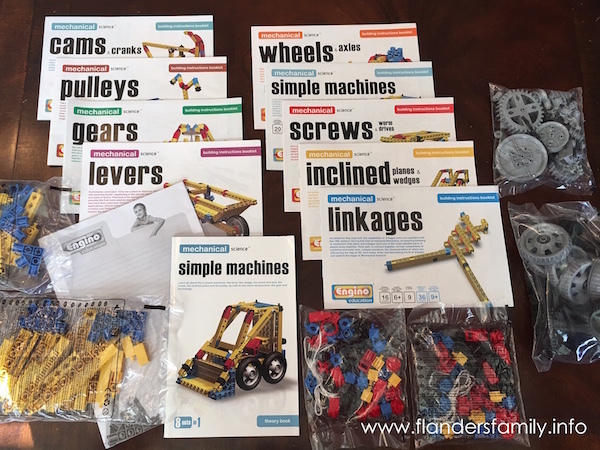 If you are just getting started in homeschooling, you might want to check out Timberdoodle’s complete curriculum packages, some of which include Engino sets similar to the one in this review. These curriculum kits were not available when we began our homeschooling journey, but they contain many of the same products we’ve used and loved for years, including Pathway Readers, Apologia Science, Story of the World, and lots and lots of other great resources.